For those who like moving pictures, a lil’ something from yesterday’s clearance test of the second phase of the Expo Line in downtown Santa Monica. We’re pretty sure it was the first time that a passenger train has gone that far west in the L.A. Basin since 1953 — when it looked like this. The Santa Monica Choo Choo is almost here! Yeah! Those pictures were fantastic, but it would have been better to start wi8th the oldest ones first. That way we all could appreciate all the progress that has been made. Now, as far as the pictures, I have a few questions about the captions under the pictures. # 1. What is the differance between a switch and an interlocking? # 2. How do the track #’s come to be? In other words, Why are the tracks numbered 3, 4, & 5? Why not just 1, 2, & 3? # 3. What is a “Blow-down Building”? I hope someone out there can answer these questions. I know will never happen but the Red Line should continues down Wilshire all the way to Downtown Santa Monica and connect to the Expo Line. It totally makes sense to extend the Purple Line through Brentwood and on to Downtown Santa Monica. It’s not currently funded, but if LA County is serious about having a decent public transportation system, serving these high-density employment and residential areas with rail is a must. The “Subway to the VA” ain’t going to cut it. @LAsian – Have libertarians figured out how to take a service that covers 25% of its operating costs and make it profitable? If so, I’m sure we’d all be extremely interested in reading your specific and feasible plan for doing so . . . It might, in another 30-40 years, if the public really wants it and makes a big fuss about “The Subway to the Sea” NOT reaching the sea. That’t the ONLY way it will EVER happen. Mass transit can be built by incorporating some profit making ideas as it is over in Asia. If LA were to give incorporate some libertarian ideas of free market capitalism and logic into mass transit operations to increase revenue which could help support funding toward construction projects, the less taxpayer burden there will be which would increase support than just the usual blanket ideas of “gimme more of your paycheck” solutions that they’ve become so reliant upon. Thanks for posting another great video. Now it’s time to restore the Mt. Lowe railway! Kidding aside, it was interesting to see the cafe in the photo of the old Santa Monica depot. I am beginning to wonder if anything will EVER go into the North Hollywood Orange Line depot, now that it has been restored. It should have a cafe as well. I hope the restoration will not have been in vain. 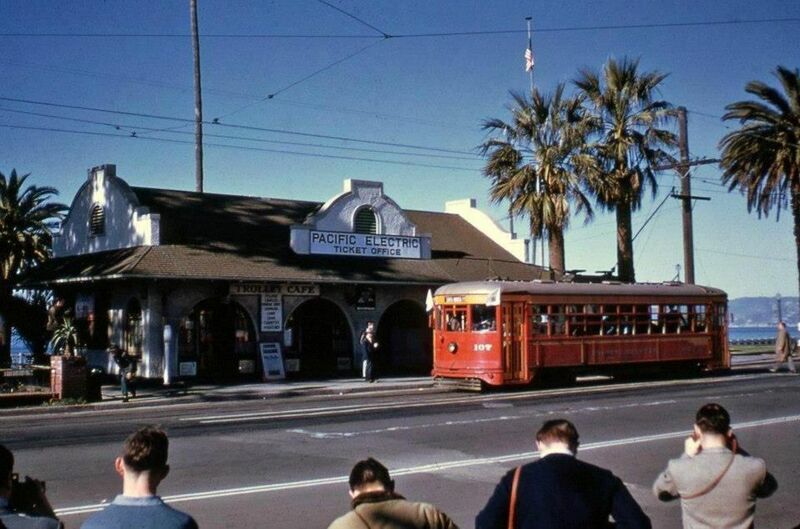 The photo under the “what It looked like in 1953” heading shows a Pacific Electric 100 class streetcar, all of which were retired in 1950 and sold to Vera Cruz, Mexico. So “1953”? Close, but no cigar. The photo is of a 700 numbered Pacific Electric streetcar. One can still them at the Orange Empire Museum. When and how will the center platform be used in this three-track station? I suppose a train on the middle track could load and unload from both sides, which might be convenient during peak hours. The last stop on the 7 Train, Flushing/Main Street in New York City borough of Queens, is a three-track station and in all cases the train in the middle track opens its doors on both sides. ^ I was not aware that this was a three track station! Oh the potential! Real rapid transit ultimately distroyed by the old MTA. And now some lines being built purely to satisfy political pressure instead of actual need. Expo will be great for Santa Monica — but BBB rerouting to favor Expo riders closes some local stops expo does not cover.Don’t make Expo and either/or decision for public transportation. We need both.